Background: Using electronic directly observed therapy (eDOT) to remotely monitor tuberculosis (TB) patients’ treatment is now a viable option due to the advancement and expansion of technology. Aims: To determine the utilization levels, benefits, barriers, and outcomes of public health departments using eDOT to treat TB. Methods: The Center for Connected Health Policy, in collaboration with the National Tuberculosis Control Association, developed an online survey to answer the study aim. In December 2015, the survey was disseminated to 68 Federally Funded TB programs (50 states, eight large cities, and 10 United States territories). Results: There were 113 qualified respondents. Seventy-six percent (n=86) of respondents were using, implementing, or planning to use eDOT. Reported benefits were high and centered on patient and provider satisfaction, cost savings, and staff safety. 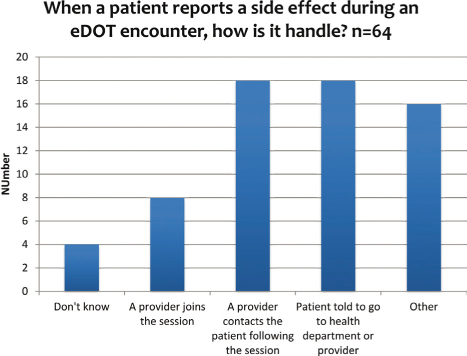 Medication adherence and treatment completion rates of eDOT users were reported to be about the same or higher when compared to in-person DOT users. 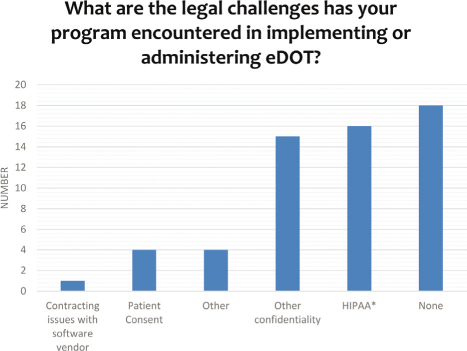 The primary technical concern about eDOT was internet connectivity; Health Insurance Portability and Accountability and confidentiality were the highest reported legal concerns. 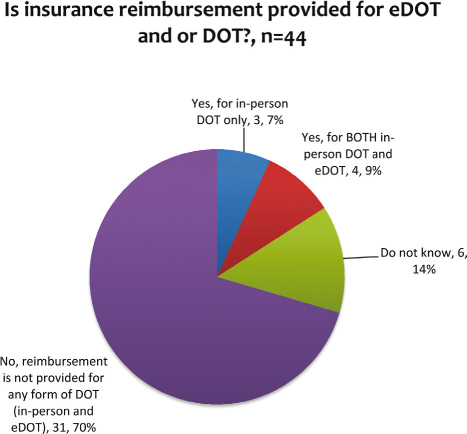 A majority of the respondents indicated that no reimbursement existed for eDOT or in-person DOT. Conclusion: Established guidelines on use of eDOT as well as policies on reimbursement and training programs should alleviate many of the existing hindrances that are currently preventing many health departments from implementing eDOT. Staff and patient satisfaction is high, outcomes are positive, and eDOT is cost effective so efforts should be made to break down the existing barriers to expansion. Tuberculosis (TB) is one of the most widespread infectious diseases in the world, infecting an average of 9 million people annually1. Although TB is curable, more than 1 million TB-related deaths occur globally each year1. In March of 2016, the Centers for Disease Control and Prevention (CDC) noted that after over two decades of decline in the United States TB cases have plateaued2. The CDC recommends the use of directly observed therapy (DOT) for administering medication to TB patients3. DOT consists of observing patients taking their medication to assure adherence to a course of treatment. Strict adherence to ingesting the medication is necessary because patients who take their medications inconsistently or stop early are at risk for disease progression and death, transmission of the disease to others, and development of drug-resistant strains of the TB bacteria that are much more difficult and expensive to treat. In the last few years, there has been an increase in the use of technology, particularly smartphones, as a tool to provide healthcare services. With technological advances combined with budget decreases for public health organizations, conducting DOT remotely with the use of technology (called eDOT) has become a viable option. Patients can schedule a time to meet with the healthcare worker (HCW) using live video (synchronous eDOT) or the patient can record him or herself taking the medication and forward the video to the HCW (asynchronous eDOT) to be reviewed at a later time. However, utilization of technology by public health departments to administer DOT has been limited. The research that does exist on using technology to treat patients with infectious diseases is outdated and used antiquated technology or telephones (landlines). One recent study on asynchronous eDOT utilized nine focus groups with asynchronous eDOT patients (n=16) and providers (n=47); four with patients (n=8) and two with providers (n=14) in San Diego, CA and one focus group with patients (n=8) and two with providers (n=33) in Tijuana, B.C., Mexico. The study participants were accepting of the technology and, when compared to in-person DOT, found it to be less burdensome and more confidential. United States patients valued the greater autonomy that asynchronous eDOT provided and Mexican patients valued improved privacy; the researchers concluded that this difference was related to culture4. To further explore the potential utilization and expansion of eDOT, the California Health Care Foundation funded two companion studies: one to look at the efficacy of eDOT and the other to look at potential barriers to employing technology to deliver DOT in treating TB. The latter study was conducted by the Center for Connected Health Policy (CCHP). While the CCHP study was broad, this article focuses on one aspect of it, specifically determining the scope of utilization of eDOT to treat TB by public health departments and what are the barriers to using it. CCHP, in collaboration with the National Tuberculosis Control Association (NTCA), developed an online survey to assess eDOT utilization, outcomes, and support needs. The Chair of the NTCA Survey Research Committee spearheaded the creation of a national workgroup. The 16 workgroup participants, including two from CCHP, were professionals with experience in TB, policy, and/or research. The majority of participants were TB control professionals in federal, state, and county agencies from six states. Following the call, revisions to the survey were made by CCHP staff and the survey was disseminated to the workgroup for a second review. Another one-hour conference call was held on October 22, 2015. The workgroup submitted their comments by November 4, 2015 and the comments were compiled and survey revised by the CCHP lead researcher. Final changes were made via email correspondence. The final survey included 49 closed ended and two open-ended questions. The closed-ended questions were multiple choice and ranking and some included an ‘other’ category where respondents could type in information. There were several skip logic patterns so that only relevant questions appeared for the respondent. The survey was entered into SurveyGizmo by two interns at NTCA. SurveyGizmo is a Health Insurance Portability and Accountability Act compliant survey software program. The survey was then pilot tested by the workgroup. Changes were made and the survey was re-disseminated on December 3, 2015 to the workgroup. The workgroup had two days to pilot test the survey, changes were made, and the survey was disseminated to the target audience on December 8, 2015. The Chair of the NTCA Survey Committee emailed 74 of their contacts at 68 Federally Funded TB programs (50 states, eight big cities, and 10 United States territories). It was expected that the survey would take 20 minutes to complete. If local TB programs were referred to NTCA by one of the people who received the initial survey, the requestor was forwarded the survey. A reminder email was sent December 14, 2015 to the 53 non-respondents. Between December 18 and December 23, 2015, two NTCA staff members made telephone calls and sent emails to the non-respondents. As of December 17, 2015, 23 jurisdictions (states, big cities, territories) had not responded. Staff person one focused on 23 jurisdictions. Between December 18 and December 21, 2015, she disseminated 25 emails (six were custom emails and 19 were generic), and made 18 phone calls. Staff person two focused on four jurisdictions. On December 22 and 23, 2015 she disseminated four custom emails and made four phone calls. Items in the ‘other’ category were recoded when it was determined by two researchers that the item fit an existing category. The data was analyzed using SAS. Descriptive statistics were used to analyze the data. The study was approved by the Institutional Review Board at the Public Health Institute. There were 120 respondents. Seven did not qualify as they did not use in-person DOT or eDOT. Half of the respondents (n=60) were from local jurisdictions, 38 percent from state (n=46), eight percent (n=9) from big cities, and four percent (n=5) from territories. Respondents were from 47 states; three states were not represented. The findings are presented here in the following sections: utilization, benefits, concerns, clinical outcomes, and resources and training. 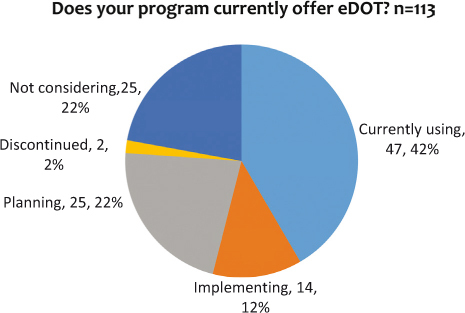 There is a strong interest in using eDOT, illustrated by the large number of programs currently using or planning to implement an eDOT program (see Figure 1). Slightly over three-quarters (76%, n=86) of respondents are using, implementing, or planning to use eDOT. Only two programs discontinued using eDOT. One stated that they discontinued using eDOT because they had only one patient on it and that patient moved out of their jurisdiction. Why the other program discontinued its use is unknown. While synchronous eDOT is the most commonly used format (see Figure 2), 23 percent (n=11) of programs used both asynchronous and synchronous eDOT. Providing patients with choices allows them to use the method that will work best for his/her lifestyle. 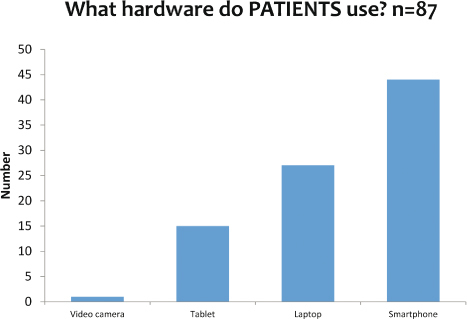 The majority of patients (see Figure 3) use their smartphone for eDOT. Most of the programs that use eDOT have less than 10 percent of their patients using it (see Table 1). The reason for the low percentage of patients using the modality is unknown and needs further exploration. The reported benefits were high and centered on patient and provider satisfaction and cost savings (see Table 2). Staff safety also was a highly rated benefit. In some TB programs, in-person DOT workers would go out in pairs to see patients; due to budget cuts in-person DOT workers now go out solo when seeing patients. eDOT improves staff safety as visiting unsafe places is eliminated. eDOT also reduces staff exposure to TB. 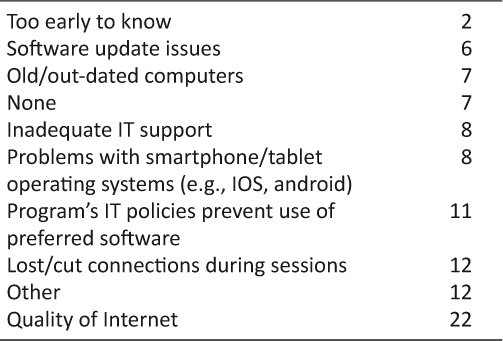 The primary technical concern about eDOT was internet connectivity (see Table 3). Most respondents reported not having legal concerns (see Figure 4), although Health Insurance Portability and Accountability (HIPAA) and confidentiality were the highest reported legal concerns and were also the second highest technical concern of information technology policies preventing the use of the software. * Health Insurance Portability and Accountability Act (HIPAA) is a federal law designed to protect the security and privacy of protected health information. Four programs (9%) that use eDOT are reimbursed for both DOT and eDOT (see Figure 5). For programs that are reimbursed for in-person DOT and not eDOT, the lack of reimbursement can be a larger barrier to utilization. For example, in California in-person DOT is reimbursed by Medi-Cal but the payer does not reimburse for eDOT. Patients tend to stay on eDOT (see Table 4). 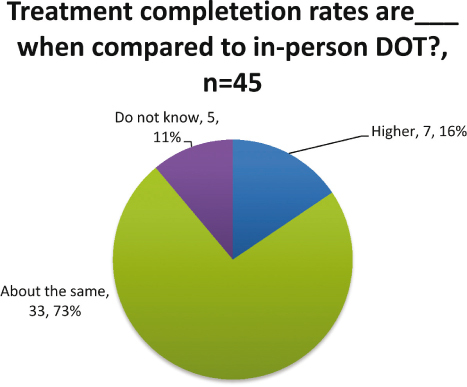 More than half (58%, n=33) of respondents said that patients were never or rarely taken off of eDOT. When patients are taken off, it is most often due to the patient missing doses. 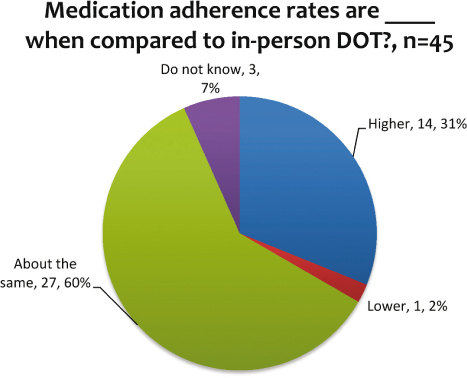 Medication adherence rates of eDOT users when compared to in-person DOT users were reported to be about the same or higher by 91 percent (n=45) of respondents (see Figure 6). 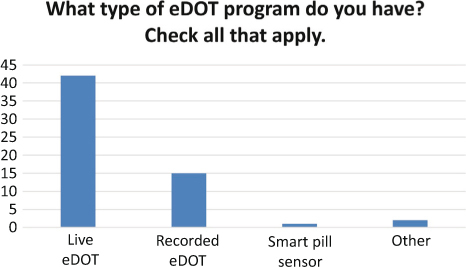 Two percent (n=1) reported medication adherence rates to be lower among eDOT users when compared to in-person DOT users. Treatment completion rates are important as well. None of the respondents reported lower completion rates for people using eDOT when compared to in-person DOT (see Figure 7). All of the respondents who knew about completion rates when compared to in-person DOT reported that they are about the same or higher than in-person DOT. These outcomes are related to managing side effects as patients may discontinue taking the medication if it makes them not feel well and hence, adherence and completion rates could drop. To address side effects, the survey respondents stated that it is most frequently handled by the patient being informed to go to the clinic or a provider contacts the patient after the session (see Figure 8). Most of the people who selected the ‘other’ category stated that the provider is notified. There was not a training topic that stood out to be much higher than the others included in the survey (see Figures 9 and 10). Therefore, a training program that covers a range of topics is needed. The training could be conducted in conjunction with TB conferences or in the form of web-based videos, toolkits, or webinars. Best practice guidelines have been found via an Internet search, but no federal agency, such as the CDC, has published eDOT guidelines. The survey results indicate that the use of eDOT is more prevalent than hypothesized. Forty-two percent of the respondents indicated they are currently using eDOT to treat TB patients and an additional 37 percent are planning or implementing it. However, most of the eDOT programs that use it have less than 10 percent of their patients enrolled in it. Determining the exact causes for this low number is beyond the scope of this specific survey. The reason for programs using eDOT with so few patients is worth future exploration. 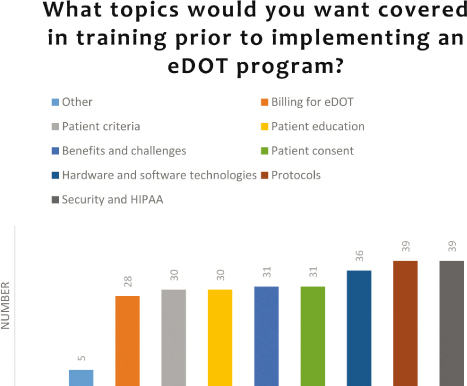 A reason for approximately a quarter of the programs not considering using eDOT, and for programs that use it with a low percentage of patients, may be due to the reported technical concerns. The primary technical concern was connectivity. Additional technical concerns centered on equipment issues such as software problems. Sporadic connections or technological glitches can lead to lost information and general frustration on both ends that would leave patients and health care workers unwilling to utilize the technology. This may be more problematic in rural areas, but that cannot be confirmed via this study. For areas with frequent connectivity problems, asynchronous eDOT may be a better option than synchronous as the stored date and timed stamped video can be transmitted when connectivity is resumed. Among the legal or policy barriers, HIPAA and confidentiality were identified as the greatest concerns. A majority of the respondents indicated that no reimbursement existed for eDOT or for in-person DOT. This lack of reimbursement, while not specifically identified as a barrier in the survey, may be a cause or factor in the utilization of eDOT. 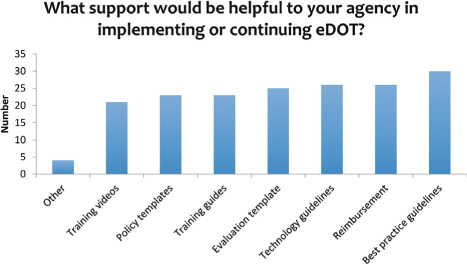 When asked what support would be helpful in implementing or continuing eDOT, the survey respondents ranked reimbursement high, but also noted the need for guidelines around best practices and the technology. That lack of sound operational guidelines also could contribute to the hesitation of establishing an eDOT program. Synchronous eDOT is the mostly commonly used form of DOT. Asynchronous eDOT provides some additional benefits to synchronous eDOT, such as weekend monitoring and more scheduling flexibility for DOT workers and patients. Asynchronous eDOT also provides another option for patients. Additional exploration is needed to determine the reason for programs opting to use synchronous more often. Numerous benefits were reported. Respondents noted high adherence and completion rates in their programs. For adherence, 91 percent of the respondents said that they had about the same or higher rates; seven percent did not know. For about the same or higher completion rates, the responses totaled 83 percent; 11 percent did not know. Additional benefits included staff safety (minimizing exposure to an infectious disease as well as reducing travel for the health worker into potentially dangerous environments) and cost effectiveness. The respondents also noted that both staff and patients view eDOT favorably. With so many positive outcomes, additional resources should be used to expand the use of eDOT as it is a viable option for treating TB and possibly other health issues, as well. Respondents indicated that training and resources are needed. Providing these to programs should assist with the expansion of this effective and efficient treatment modality. With the numerous benefits and positive clinical outcomes of eDOT, it appears that it is worth exploring the use of this modality for other health issues. Patient nonadherence to prescribed medications is associated with poor therapeutic outcomes, progression of disease, and increased healthcare costs. Patients with infectious diseases, mental health problems, and chronic conditions may benefit from using this medication delivery method, as well. Using eDOT for communicable diseases or health problems that require the use of expensive medications may benefit from the application of eDOT and would be worth exploring. A limitation of this study is that three states were not represented, and it is unknown if rural areas were adequately represented in the survey. As an online survey, the opportunity to further explore the results was not present. For example, it would have been useful to know why most programs had a low percentage of patients on eDOT. Another limitation is that the factors that make a patient a poor candidate for using eDOT (e.g., language barriers or disabilities) was not explored and would be useful with identifying best practices. The use of eDOT is a viable and more widely utilized means of treating TB patients than initially expected by the researchers. Public health departments that have been utilizing this technology have found it to be beneficial in meeting adherence and completion goals in DOT. However, while the benefits are apparent, barriers to widespread expansion exist. Identified issues are primarily related to technology, training, and security. Addressing these issues will lead to greater and more efficient utilization of eDOT by public health departments. Established guidelines on use of eDOT and policies on reimbursement should lead to more comfort in operating the equipment and supporting the program. More research is needed on eDOT for TB as well as other infectious diseases or health issues. A large scale national study is needed where lessons learned and best practices could be extracted and shared. Common metrics are needed for such a multi-site study. CCHP would like to thank the California Health Care Foundation for their support of this study. CCHP would like to acknowledge the National Tuberculosis Control Association (NTCA) for their assistance in the development of the survey, the coordination of the national workgroup, and assistance with data analysis. We also want to thank Mario Gutierrez, Dr. Richard Garfein and the workgroup members for their contributions. 1. Kendall, A. E. US Response to the Global Threat of Tuberculosis: Basic Facts. Congressional Research Service, Library of Congress. 2011: 1–12.